The Difference Between 43 and 44? Not So Much. One of the "humbling" aspects of the job for President Obama may be how much his tenure resembles his predecessor's. DALLAS--President Obama was fittingly if uncharacteristically gracious in describing his predecessor on Thursday. Speaking at the dedication of the George W. Bush Presidential Center, Mr. Obama praised Mr. Bush for his "incredible strength and resolve," his "compassion" and his "commitment to reaching across the aisle." "The first thing I found in that desk the day I took office was a letter from George," Mr. Obama recalled. "He knew that I would come to learn what he had learned--that being president, above all, is a humbling job." It might be particularly humbling for the 44th president to reflect on how similar his presidency has turned out to be to his predecessor's. Both enjoyed bursts of popularity early in their first terms--Mr. Bush after 9/11, Mr. Obama immediately upon inauguration. Both soon came down to earth, so that their approval ratings were slightly below 50% by re-election day. Both were underestimated, with their detractors believing wrongly that public rejection of them had reached a tipping point and they could not win a second term. Both defied those expectations by defeating a lackluster challenger from Massachusetts. More significant, both were highly polarizing, at least in the first term. Mr. Bush was as admired by conservatives and loathed by liberals as Mr. Obama is the other way around. In February 2005, just after Mr. Bush's second inauguration, the Federalist Society and The Wall Street Journal conducted a survey in which scholars were asked to rank the presidents. Unlike other such surveys, ours overrepresented conservatives so as to correct for academia's extreme leftist bias. By the end of Mr. Bush's presidency, the liberal view seemed to have prevailed among the public. The president's approval rating in October 2008 was a dismal 23%, according to the Washington Post/ABC News poll. Historians on the left had become, if anything, even less generous. Princeton's Sean Wilentz published a 2006 article in Rolling Stone--generally regarded as a step below a peer-reviewed scholarly journal--titled "The Worst President in History?" Columbia's Eric Foner affirmed that Mr. Bush deserved that superlative. Douglas Brinkley invoked the awkward image of Mr. Bush "forever handcuffed to the bottom rungs of the presidential ladder." Liberal journalists rendered similarly harsh judgments, although one wonders why they bothered, given that the professional scholars seemed quite capable of publishing their own truculent first drafts of history. The Bush-was-the-worst myth served a political purpose for Mr. Obama, enabling him to excuse his own shortcomings of leadership by blaming them on the "mess" he had "inherited." (Never mind that Mr. Obama was not some crown prince but an elected politician who aggressively pursued the office he now holds.) It also fed into the historians' and journalists' fantasies of Mr. Obama's greatness, allowing them to imagine him as Lincoln to Mr. Bush's Buchanan or as FDR to his Hoover. 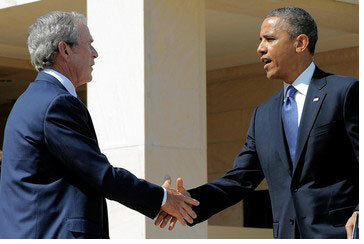 Yet it would be a mistake to put down the public's disillusion with Mr. Bush to the success of this propaganda campaign. His second term really was somewhere between disappointing and disastrous. And here is where the parallels with Mr. Obama--based on events from last week alone--are most intriguingly suggestive. Mr. Bush overread his second-term mandate. "I earned capital in the campaign, political capital, and now I intend to spend it," he declared the day after his re-election. He spent it putting forward a bold proposal for reforming Social Security. It died for lack of support in his own party. Last Wednesday Mr. Obama raged impotently in the Rose Garden after his first major second-term domestic initiative--gun control--died from the same cause. Mr. Obama is likely to pay a political price in his second term as Americans increasingly feel the effects of his most important first-term victory. Last Wednesday Sen. Max Baucus, a key architect of ObamaCare, characterized the law's execution as a "train wreck." In February 2007, Sen. John McCain used exactly the same phrase to describe the war in Iraq, which he strongly supported. Events beyond the president's control--Hurricane Katrina, the financial panic of 2008--accelerated the public's loss of confidence in Mr. Bush. One such event occurred last week in Boston, and while it's far too early to gauge its political effects, it does refute any claim that either Mr. Obama's conciliatory rhetoric or the killing of Osama bin Laden was sufficient to end jihadist terrorism. Mr. Bush's hardheaded antiterror tactics look wise in retrospect--including, it would seem, to Mr. Obama, who has largely ignored his promise to scrap them. If Mr. Obama has as humbling a second term as Mr. Bush did, he may find reassurance in the thought that history's ultimate judgment is likely to be more tempered. That's how it seems to be working out for the 43rd president. Earlier this week the Washington Post/ABC poll asked respondents to evaluate the job Mr. Bush did as president. He now has an approval rating of 47%, higher than at any point since the early months of his second term. Mr. Obama's approval rating in the same survey: 47%.